One of the skills taught in many critical thinking courses (and in my own textbook) is the use of diagrams to illustrate the components and logical “flow” of an argument. Use a circle to represent your main point. Use squares to represent reasons supporting your point. And use arrows to show the flow of logic — to start at the reason you’re giving and to point at the conclusion it supports. You can also read the diagram from the bottom-up. What’s your main point? What reasons are you offering to convince your audience? You can of course take the reasoning a step further, and that can be reflected in your diagram. You can use additional squares to represent additional reasons, in the form of data or other evidence offered in support of your main reasons. You can again read the diagram from the bottom-up. What’s your main point? Next: Why? What reasons are you offering to convince your audience? Still not sure? 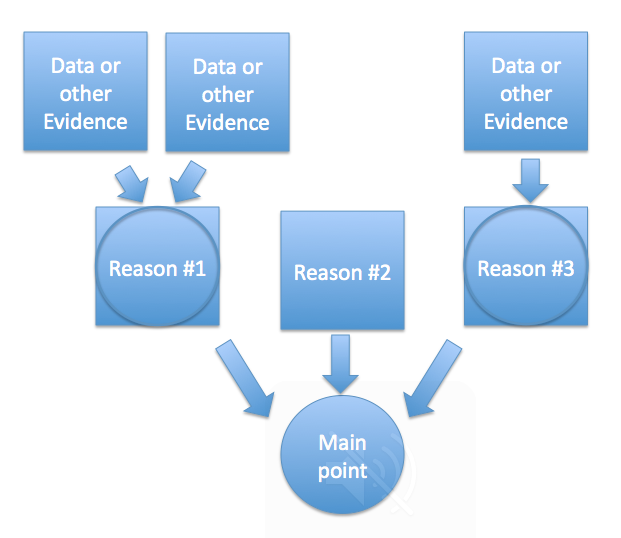 What further reasons (data or other evidence) are you offering in support of each of your reasons? 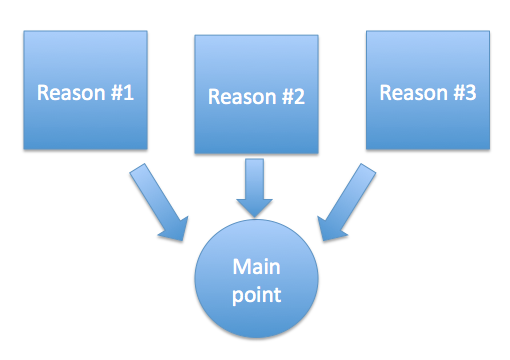 If we mapped out the steps in that argument, it would look just like the right-hand parts of the diagram above: a main point, supported by a reason, which is in turn supported by further a further reason or evidence. This entry was posted in Uncategorized on May 3, 2014 by Chris MacDonald.